We knew it was unlikely that we would get out for a sail this weekend and so it proved. Sat morning was dry but cold so we set about completing our list of chores. Jo needed to replace the toilet pump in the aft heads. Those of you who know us well, will know that anything to do with the heads (aka toilets) is always on Jo’s job list. Whilst this particular job wasn’t too arduous, there was a fair build up of limescale and therefore crap to deal with. Still, all sorted for the season ahead. Liz, meanwhile, was determined to fix several torches that had decided to stop working (and no, it wasn’t just the battery!). After that, the next job was replacing one of the speakers in the cockpit. We can now play Liz’s Ibiza tunes at full blast in the cockpit – essential party music! On a more mundane level, we inflated the life jackets to ensure there were no leaks and ran the engine. We decided not to clean her as she will be lifted out and the teak repaired before we are back out so it seemed a waste of time. After that, we sat down to supper on board and watched various programmes we had downloaded with the heating on and a bottle of wine opened. 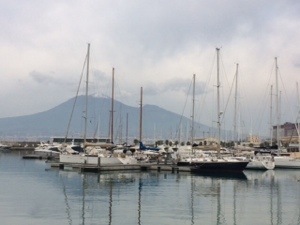 Sunday morning was bright and cold again so we decided to run around the marina. We managed 5k and still didn’t do it all – we did say it was one of the largest in the Med! We were thinking of going to Herculaneum on the way back to the airport but it was literally a fly by as we left later than planned. The area looked like a dive – no surprise there – and lots of tiny alleys to drive down. Could be interesting in the height of summer! 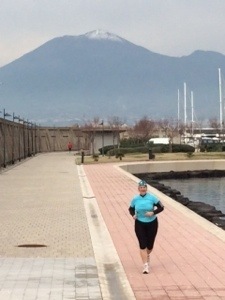 Pictures below of Nimmie and Jo running with Vesuvius as a backdrop! This entry was posted in Equipment, News and tagged 2014, Equipment, Italy, Maintenance, Med. Bookmark the permalink.